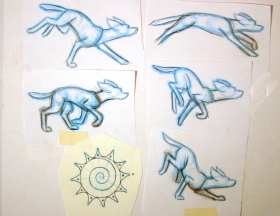 For insights into my creative process and my steps for carving stylized stone animals, select the tabs below. about aspects of Ellen's creative process. 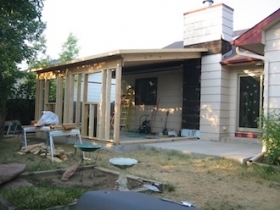 My husband and I had a studio built on the patio slab in our backyard in the summer of 2012. 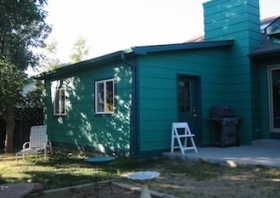 A permanent home for my creativity at last! 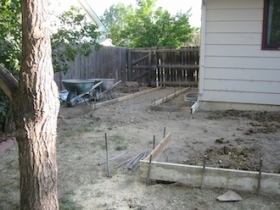 Enlarging the patio foundation and the beginning of the ramp. The studio starts to take shape. Getting a sense of scale. Double doors in the back. This is where big stones enter as blocks and leave as sculptures. View of my carving stand through the front door, looking back through the loading doors. 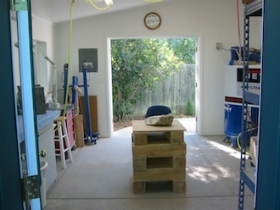 View of my carving stand — looking towards the front door. Here’s a clearer view (no dust) of me working. I am a life-long learner. One of my life philosophies is to always come from a smart place—I always want to know more than enough about what I am going to do. That confidence allows me to proceed happily, unencumbered by doubt. I love animals unconditionally, and I love learning about animals—they are an amazing treasure in our lives. 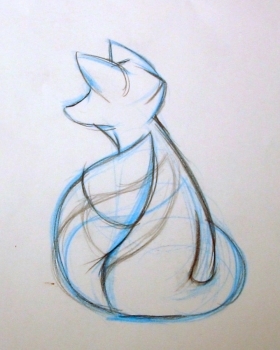 As an animator at Disney I mostly brought animal characters to life. This required an enormous amount of research in order for me to become that animal and act as that character. 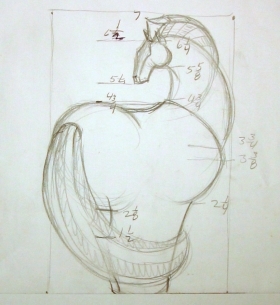 (Animators are really actors with pencils.) I needed to learn how the animal was put together, how it moved, and how it thought about life. Then I combined the knowledge of the real animal with the personality of the animated character. Totally fun! I do a similar thing in researching animal subjects for my sculptures. First-hand observation along with books and videos are my primary resources. Sometimes the animal is hard to find even in a zoo. For example, no platypuses are allowed out of Australia. Video documentaries were most helpful in discovering who this creature is, how he moves, and how he lives. 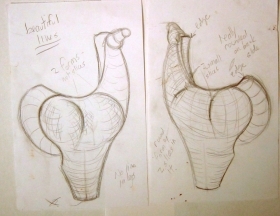 Once I arrive at a pose, I then draw it from as many angles as I am able—this is another skill learned from animation. I want to understand the pose dimensionally in my head. 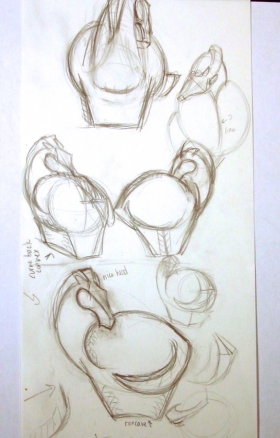 Most often I will then make a small clay model of the pose to make sure it will work from all angles as I think it should. Stone sculpture takes a very long time to create, and I don’t want to waste my time on something that may be doomed from the start. This planning process allows me to ask and answer as many questions as I can think of before putting blade to stone. 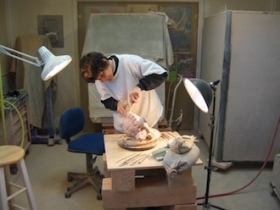 It also allows me to know the sculpture in great detail before making it and decide whether I like it. I need to fall in love with my subject and design because this is the energy that will inspire and sustain me through the process of making. Raw carving stone comes in all shapes, sizes and conditions. 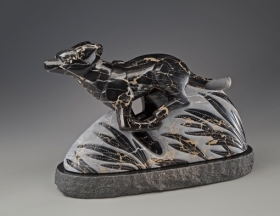 Much of the stone I carve comes from quarries where the stone is cut from massive stone deposits in the earth with giant wire and diamond saws. Enormous blocks are cut from the quarry and then divided into smaller blocks. 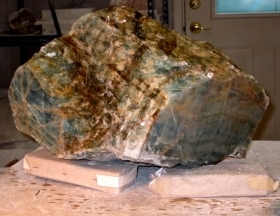 Some stones occur as boulders that are dug up and then cut down to smaller sizes with a chain saw. Some boulders are so small they require no additional cutting. Boulders may have oxidized stone on the outer layer that needs to be chiseled away to find the uncompromised “good” stone. Calcite and alabaster are two stones that can have quite a bit of oxidation on them. 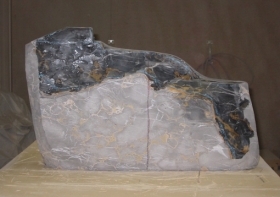 Some stones are ends from the quarry process. They are irregular shapes on 4 or 5 sides with perhaps only 1 or 2 machine cuts to take these ends off the large block. 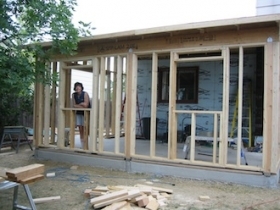 They can be wedges, trapezoids, multi-sided chunks, or any irregular shape. Stones like travertine are formed with water percolating through the stone over millions of years dissolving and re-crystallizing calcium carbonate. 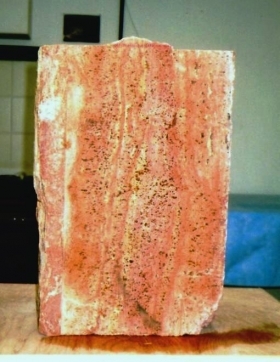 Red travertine is formed in caves and can have fossilized tree branches included in the stone. 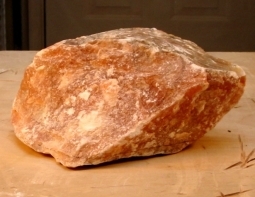 Translucent Orange Alabaster usually forms around clods of mud which are, to me, a coveted inclusion in the stone. It is very important to inspect your stone for cracks and unwanted inclusions before carving it. This is easier said than done, as there is no way to truly know what lies within the stone. A piece of stone can be balanced on an end and tapped with a hammer to see if it rings. Mostly if it rings beautifully the stone is whole. However, I have had some stones ring that had cracks. Also, only smaller stones may be tipped and tapped to ring. Larger pieces weigh too much and have too much mass to ring. Some colored marbles can have teeny microscopic gaps between color changes. These are found in decorative marbles, the ones with opulent color. They are grind-only (cutting with a diamond blade creates too much vibration for the stone) and glue-as-you-go stones (bathing the stone in extremely thin super glue after each carving session) because you never know if there are gaps and you never know how extensive they might be. Raw classic white marble from the quarry in Marble, Colorado. 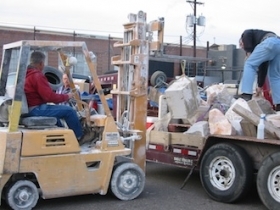 Marble from this quarry was used in the Lincoln Memorial, the Tomb of the Unknown Soldier, and civic buildings throughout Colorado and the U.S.
My “Phoenix Rising” sculpture was started there at the Marble/marble Symposium. “The King of Winter” is started from the pure white Sivec (sa-VETCH) Marble from Macedonia. 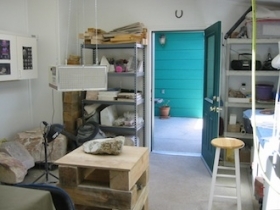 All of my sculpture stone comes from Myles Schachter of 2Sculpt. 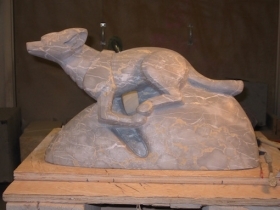 Learn about Myles story and his quest for great sculpture stone on the next tab of this page, “Stone Hunt”. I am a stone sculptor. I have searched for carving material throughout the world. Eureka! I have found it again and again! Now I sell the results of my hunts so that I can support this adventure compulsion. 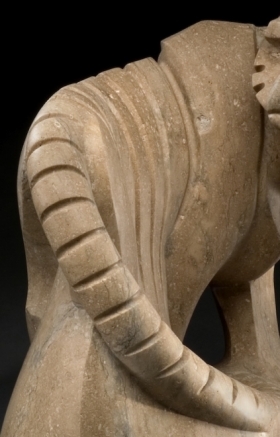 There are some very good American alabasters, limestones, marbles, travertines and onyxes. However, the selection is relatively limited. In Persia there is a huge variety of colorful translucent stones. 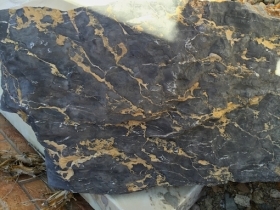 In Belgium there is a jet black marble. Portugal has the finest pink marble. Turkey has a nice-to-carve purple and white marble. I have traveled to some of these countries to pick out the highest quality pieces. The trips have been wonderful, but each find requires the purchase of a container of the same stone. This means 43,000 pounds of pink marble OR red travertine OR lilac marble. Shipping to the US is very expensive and rates don’t change much when you buy less than a container. 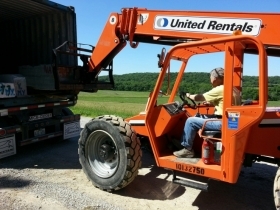 Hence, it only makes sense to buy a full load at a time. So, although I do occasionally visit these places, I primarily make an annual visit to Italy. It has been the world’s stone center for centuries. I am still required to buy the full container-worth, but I can get a great variety of stones. 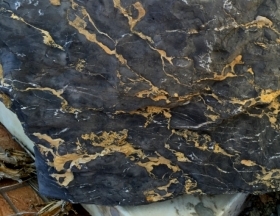 The last load included a new black marble, Portuguese “Spotted Fish”, “Tobacco” marble, as well as the standards–Carrara white, black and gold Portoro, Moroccan Fossil, and more. If I had not gone to Italy I would have not found these exotics, and the quality may not have been up to my standards. On my last trip I also paid a visit to the Italian alabaster supplier. Again, I couldn’t resist! I ended up buying another whole container of slabs and boulders in Ice, Blue Ice and Champagne alabaster. 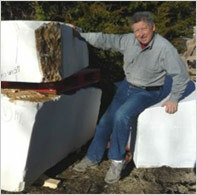 I was not so lucky years ago, when I first started buying stone in massive quantities. I was shown the “trash” of stone. Some were old and not carvable. Others were loaded with internal cracks. Many were overpriced. The worst part was the disinterest of the sellers. Sculptors are a “gnat” to their business. Their money is made selling for counter tops and building materials. Once I tried to buy a container of marble of one type. I was asked how many containers I would buy a month. When I told the truth I was “shooed away.” Conversation over. It took a few years to befriend a local Italian agent who “looks out for me.” He emails me regularly when special pieces show up and he can reserve them until I get there to inspect. 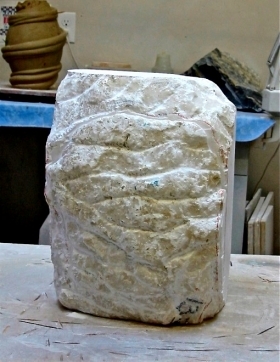 Recently he found a large block of Michelangelo “Statuario“ that I would never have found on my own. Another part of this puzzle is US Customs. Duties are charged on some things and not others. For me they range from zero to 5%. 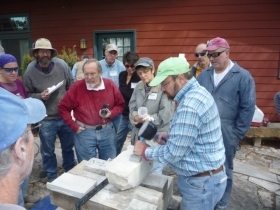 The trick is to know how to classify your stone (and tools) to minimize the fees. Still, though, Customs may decide to “pull” your container for inspection or the dreaded “intensive” inspection. They may be looking for insects or contraband. And when they pull it they actually take it from the ship or train to another site to be opened and examined. Who pays for the “pulling”, the inspection and the extra days of container use? The importer pays, which is me. This can be a real surprise! 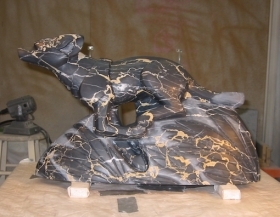 So, beyond these logistic hassles, there is the fun of this hunt for gorgeous carving stone. In Portugal there are 70 quarries in 11 kilometers—I worked with one quarry-man who took me down, down, down to the bottom of a quarry to pick out my pink marbles. In Turkey, the non-English-speaking owner took me to his quarry to find three colors of stone and a cave filled with stalactites! After five years of searching, I finally met the owner of the Argentina stone mine and now get amazing onyxes and fluorites. Most people are nice in the stone industry. Like any business you have to be on guard for the pots of coal. But then, with perseverance, there are the glorious pots of gold. 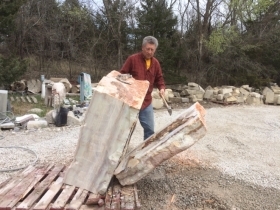 If you’re interested in learning more, Myles conducts two 2Sculpt workshops every year on “Myles’ Mountain” in his stone yard near Lawrence, Kansas. I use only a few tools, mostly circular diamond saw blades in a variety of sizes and electric angle grinders. I also use a variety of diamond burrs with an air-powered die grinder for more detailed carving. I like to keep the mechanical part simple. Each tool can be used in a variety of ways, and I get to know my few tools very well—which inspires confidence in me. My designs can be extremely complex and I don’t want to be puzzling over the tools I use to make them. However, once in a while I will need to explore a new tool or technique in order to achieve my design goals. Safety gear is always my first concern. 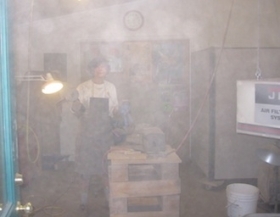 A full face respirator is essential if one is going to carve a lot of stone. Gloves with padded palms really cut down on vibration from the tools. 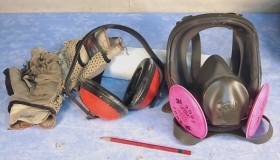 Ear protection is absolutely necessary. I am not sure what I create in greater quantity—noise or dust. My tools are the same basic things, just in different sizes. 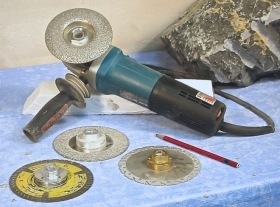 7-inch angle grinder and electroplated diamond blade for cutting off big amounts of stone in a short time. The 5-inch angle grinder with 5-inch blades and cup wheel is for more precise cutting. 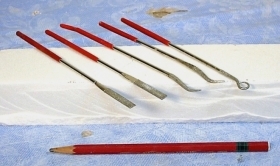 The yellow blade on the right is the sintered blade for very hard stone or very soft stone. The middle blade is braised diamonds, my favorite all-around blade. Left is a very thin diamond blade for fast cutting. Decorative marbles are basically grind-only once you take off the minimum of extraneous stone. I am a careful sculptor and plan each “cut” to make sure I do not take off stone I will want later. I tend to use less aggressive tools with less vibration rather than risk losing a nose or an ear. One can never really trust a decorative marble until it is finished and you’ve made it through the process. 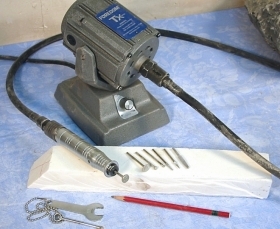 Die grinder with wheel burrs for cutting and round burrs for grinding. I use these for cutting more detail and for cutting in hard-to-reach places. Foredom Flexi-shaft tool with very small wheels for cutting, and a variety of small grinding burrs for greater detail and smaller spaces. I use several of the small grinding burrs to create textures on the final surface of the sculpture. Braised diamond rasps and steel Italian rifflers are the last carving tools and the first finishing tools. All my sculptures are carved with power tools and finished by hand. Files take out the brutal scratches left by the rasps and rifflers and leave a very nice “skin” or surface. Superb filing is the key to a superb final surface. Electroplated diamond jewelers files are terrific for refining details. Diamond sanding pads are my first sanding tools. I always sand the lowest grit, 60, dry. I may also sand 120-grit dry depending on how high I am going to sand a particular marble. After that, I sand with lots of water to create a deep finish. Water is another key to a gorgeous finish. I use silicon carbide sand paper from 80-grit (very coarse) to 2,000-grit (very fine.) Some marbles are only sanded to 120-grit, and some are taken to 2,000-grit and then polished with a mixture of wax and very fine abrasive. Carving stone is about 90% common sense. Stone is heavy and brittle. If you drop it, it will break. If you force it or leverage it, it will break. If you hit it the wrong way it will bruise. If your design is top-heavy it will fall over. If it is too thin in the middle it will break in half. The trick is to know this stuff before you begin, and sometimes these things must be learned the hard way. Each stone has its own properties, so some stones can be pushed much more than others. A lot of times you learn as you go along. The key is to know which questions to ask—will I be compromising a part of the stone I wish to keep if I cut off a particular mass? where is the bedding plane (the layers of sediment laid down over geologic time—this is something like the directional nature of pages in a phone book) and how strong is it? are the different colors in the stone all of the same relative hardness? 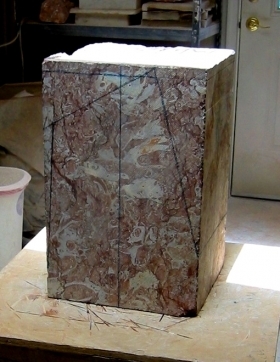 2 – First cut off all the compromised stone (oxidation, edge and surface cracks,) mentally position the design within the stone, flatten the bottom. 3 – Blocking passes follow the silhouette of the form. I take off unwanted stone in blocks because circular saws cut in straight lines. 4 – Start cutting from the top down and take off the big masses. Carve “fat” so you leave plenty of space for the design in case anything unpredictable happens. You must cut off the first thing first and the second thing second, etc. If you try to cut off the fifth thing second you will risk breaking the stone. The key here is to know which is the first, second and etc. things to cut. Common sense dictates that you start at the top and work your way down. Do not undercut anything until you have made the top part lighter. 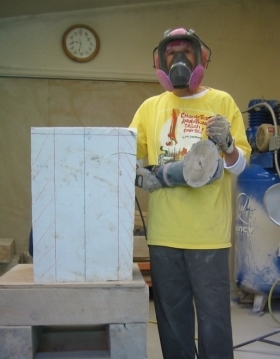 Don’t take too much weight off the base area too soon in order to have a sturdy stone to carve. It is most annoying to try to carve a stone when you are afraid it will fall over. 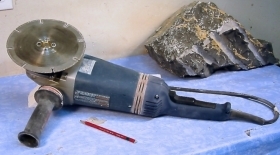 5 – Roughing-in passes are done with smaller cutting wheels and grinders. I leave the security of the block and begin to find the actual forms. 6 – Refining passes are done with smaller burrs and specifically define the forms. I finish all my sculptures with hand tools—carbide rasps, steel files, silicon carbide sandpaper, little diamond burrs on a flexi-shaft tool for texturing, different chemicals and waxes. 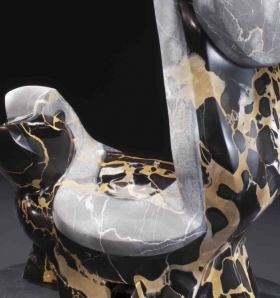 Finishing the sculpture is a world of experience unto itself. 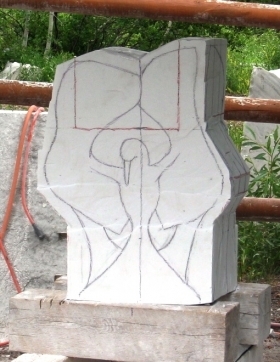 I always have a detailed vision of the completed piece before I begin to make the sculpture, right down to the finish I will create for the final look. As I am carving the design, I think about how to do the finish and run experiments when I am done carving for the day. That way, when I get to the finishing stage I know exactly what I will do, how I will do it, and have any necessary new tool or goop or polish already at hand and familiar to me. 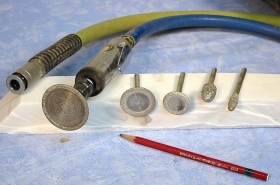 7 – My final passes consist of rasping, filing, sanding, texturing, and polishing. All finishing is done with hand tools. “Save the Tiger” has a finish sanded to 180-grit, a low polish, and texture is repetitive cuts. “Male Quail” has a finish sanded to 180-grit like “Save the Tiger.” Texture is a variety of different cuts in 3 different repetitive patterns. “World’s Best Dad” is sanded to 600-grit, a quite high finish, with a repetitive pattern cut in squares. 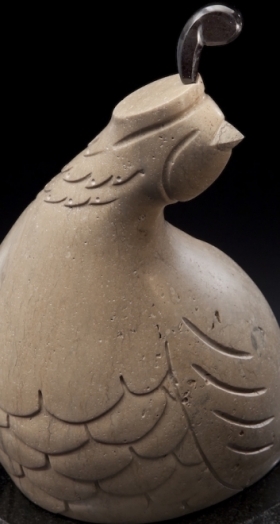 The chick is raw stone sanded to 60-grit, a very low finish. 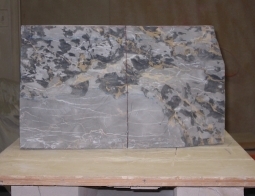 “Phantom” has raw stone textured for the light gray areas. 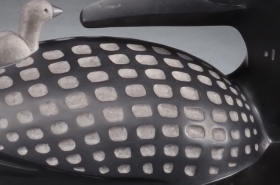 The shiny black is the same marble sanded to 2,000-grit, a very fine finish, and then this finish is polished with a mixture of wax, black pigment, and tin oxide (called black rouge) to achieve a polish of 10,000-grit. This is the highest shine I can achieve with my tools. “Smile!” shows stone finished to 600-grit to bring out the color and create a very smooth surface. 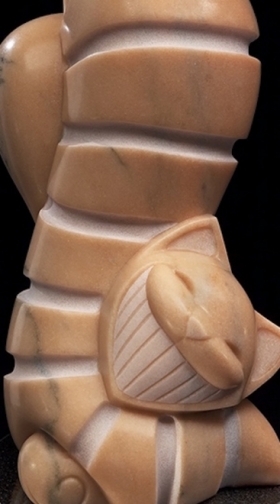 The stripes, teeth, and inside ears are carved, then finished to 60-grit, then textured to produce a very light color in the same stone. 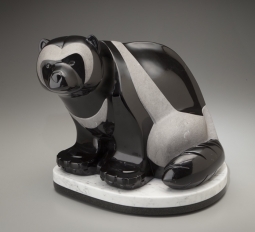 “The Uptown Skunk” is sanded to 2,000-grit, then polished with a poisonous (!) mixture of oxalic acid and tin oxide to produce a very high shine. 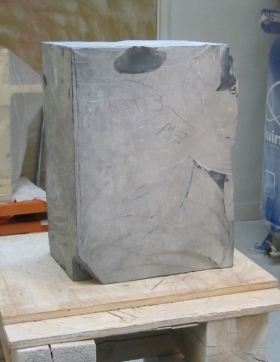 The acid melts the stone and the tin oxide polishes the stone as it is melting. The process is arrested by rinsing with water. 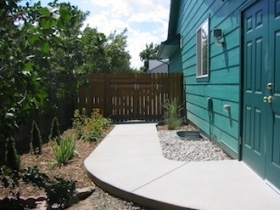 The very light gray areas are raw stone sanded to 60-grit and then textured. 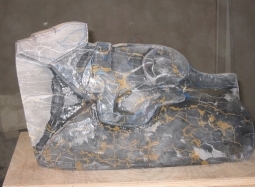 “Master of Disguise” is carved raw stone with cut textures, and then two different kinds of texture with different tools. The lighter color is the rougher texture since roughly finished stone crystals are lighter in color than more smoothly finished crystals. The shiny orange is the stone sanded to 600-grit, then treated with a chemical color enhancer and then waxed. I do not like making mistakes, and I do not like not knowing what I am doing, especially when I am immersed in a creative project. I do not want to leave the zone. By running experiments ahead of time I am able to think up and answer nearly all the questions that pop up. 8 – Familiar but tricky stones require some practice to get the technique down. 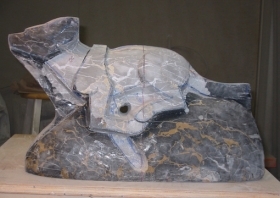 I like to polish Portoro Marble with a mixture of oxalic acid and tin oxide. You make a paste of this mixture and apply it to the well-sanded stone with a felt bob and rotary tool. 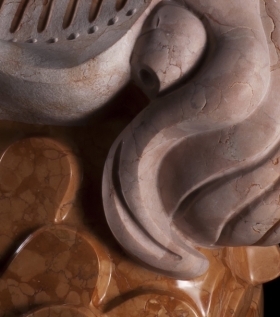 It is poisonous and extraordinarily messy—but the sculpture is gorgeous when polished! It is always necessary to practice in order to get a consistent shine with the bob and paste. 9 – The last step in my process is shooting the finished sculpture, “One For All“, with professional photographer Mel Schockner.